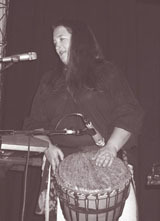 Debbie (keyboards, percussion, vocals, occasional guitar) studied piano from third grade through college, and voice from high school through college. Realizing quickly that the originally planned pre-med major was not the right place to be, she turned to her love for electronic gizmos and majored in television production and minored in theatre tech and music. After college, she focused on community theatre and graphic design as her creative outlets, but then drifted away from theatre after moving to Indianapolis. Having friends involved with Blaq Lily and then Mother Grove put her behind the sound board and brought about the formation of Small Green Alien Productions (providing sound reinforcement for Indy-area bands and now acting as manager for Wild Mercy). It also kindled a desire to do more than just run sound, which is why you'll now find her onstage with Wild Mercy! To keep the bills paid (and further indulge the love for techie toys), Debbie works as resident Mac Geek for a local publishing company and is a partner in Alien Creed LLC, providing web hosting for geeks and sci-fi fans . full of mementos. I like drums; they calm me. in "Drumming at the Edge of Magic"